Special Event: YA/New Adult Contemporary Giveaway! I haven't yet had the opportunity to read Easy by Tammara Webber, but I liked her novel Between the Lines and Easy's mature edge felt perfect for this giveaway! Here are the summaries for the novels to amp up your excitement! SAVING YOU, SAVING ME (You & Me Trilogy #1): 18 year old high school senior and aspiring psychologist Samantha Sullivan (Sam) never thought she would fall for the one mysterious guy she has been speaking to over the phone for months, the boy the counselors called Daggers. She wasn't supposed to talk to him outside of their sessions. But as she began to peel the layers of Daggers and learn who he is, the one boy she is supposed to be saving, might just be the one who is saving her. Saving You Saving Me inspired the Saving You Saving Me Project found at: http://www.SavingYouSavingMe.com The Saving YOU Saving ME Project was inspired by the book, which tells the story of Samantha (Sam) Sullivan, who becomes a peer counselor at a teen and young adult crisis center called Sawyer House. The Saving YOU Saving ME Project tries to replicate the atmosphere of Sawyer House by allowing a place for teens through adults a place to share their issues anonymously and in doing so, might be able to help others learn from it or might receive feedback from people about what to do. LOVING SUMMER (Loving Summer Series #1): Summer has always looked forward to spending her summers at her Aunt's beach house with the Donovans. To her, summers at Aunt Sookie's beach house was magical, especially getting to spend time with the Donovans - her best friend Rachel and Rachel's brothers Nathaniel, and Drew. Here at Aunt Sookie's beach house, they can be anyone and anything they dreamed. For Summer, she had always wished to become as pretty as Rachel and for her brothers to think of her as more than Rachel's friend. For Nat and Drew, summers at Aunt Sookie's beach house meant fun and escape, a place where they go to with their mom and sister for the summer, away from city life. They never thought this summer would be different. They never thought things would change as much as they did...and it all began with them falling for and loving Summer. EASY: When Jacqueline follows her longtime boyfriend to the college of his choice, the last thing she expects is a breakup two months into sophomore year. After two weeks in shock, she wakes up to her new reality: she's single, attending a state university instead of a music conservatory, ignored by her former circle of friends, and failing a class for the first time in her life. Leaving a party alone, Jacqueline is assaulted by her ex's frat brother. Rescued by a stranger who seems to be in the right place at the right time, she wants nothing more than to forget the attack and that night--but her savior, Lucas, sits on the back row of her econ class, sketching in a notebook and staring at her. Her friends nominate him to be the perfect rebound. When her attacker turns stalker, Jacqueline has a choice: crumple in defeat or learn to fight back. Lucas remains protective, but he's hiding secrets of his own. Suddenly appearances are everything, and knowing who to trust is anything but easy. I want a big turnout for this giveaway so make sure you tell all your friends about it and share, share, share! 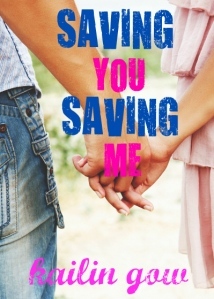 Saving You, Saving Me Book Trailer: Very romantic video! Loving Summer Book Trailer: This trailer has the most sweetest song for background music! Awesome giveaway ;) Thank you! Great giveaway! Would love to win! Thanks! Thanks! Really love you guys! I was not familiar with Kaitlin Gow. I think I'll be adding Saving You Saving Me to my wishlist along with Easy. I would pick Saving you saving me! I love that book! All three books look awesome! I really want to read Easy! I would pick Easy! They all look awesome though!